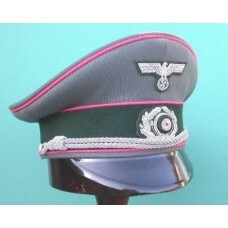 Army Panzer Officers Schirmmutze with tricot top, pink piping & bottle green band. Complete with aluminium chin cord, hand embroidered silver bullion wire wreath & cockade. Supplied with bullion wire eagle. No sewing service. Also available with 'doeskin' top. 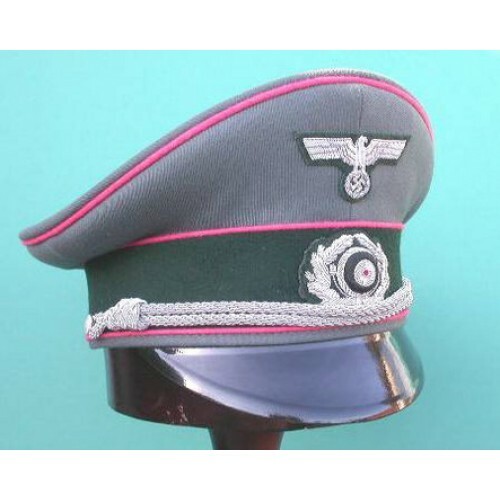 Select other piping colours. 1X59 with Tricot top in my stock for immediate delivery.